So as part of my quest to get through the TBR pile threatening to tumble from my bedside table and crush me in my sleep, I’m trying to read a short story or a novel chapter religiously before bed. 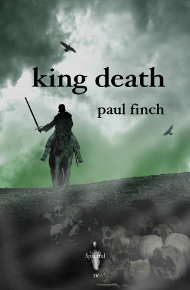 Last night it was Paul Finch’s King Death from Spectral Press (brainchild of Simon Marshall-Jones). The pace is wonderfully managed, Rodric’s opportunistic pragmatism is beautifully balanced between repellent and understandable, and the ending is unexpected. Finch has provided a convincing vision of Britain in the grip of the Black Plague, summoning the same kind of threatening atmosphere as that embedded in Poe’s “Masque of the Red Death”, and illustrating the terrible equality of this epidemic as it lays low both the rich and the poor. This piece is also included in Paula Guran’s Year’s Best Dark Fantasy and Horror 2012, and quite rightly so. And! It’s also on the short list for a British Fantasy Award for Short Fiction. Huzzah! This entry was posted in News, On Writing: Short Stories, Pimping/Promoting! and tagged King Death, Paul Finch, Paula Guran's Year's Best Dark Fantasy and Horror 2012, Poe's "Masque of the Red Death", Simon Marshall-Jones, Spectral Press. Bookmark the permalink.